The Atlas Copco LH 400 E handheld hydraulic breaker rental is available in Rochester NY, Ithaca NY and Upstate NY from the Duke Company. When the going gets tough the LH 400 E are two of the most powerful handheld breakers in the world. They are used for demanding jobs in heavy asphalt, reinforced concrete and foundations. 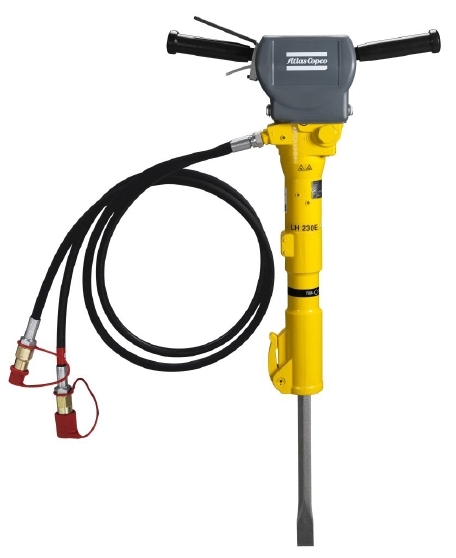 Atlas Copco breakers come in three versions: Standard, E and HBP. The E-versions reduce vibration by around 70 percent compared to a standard breaker. The HBP is especially made to accept higher back pressure in the return line. HBP breakers can be operated from almost any hydraulic outlet.